EXTRO' COSMESI BAY RUM HANDCRAFTED SHAVING CREAM 150 ML Extrò Cosmesi Bay Rum handcrafted shaving cream 150 ml. 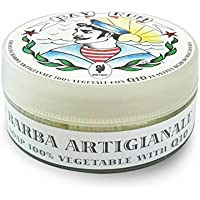 100% vegetable shaving cream with Q10, elastin and macadamia oil. In large glass bowl. Entirely handmade product. Bay Rum shaving cream enriched with q10 coenzyme, a precious wrinkle, elastin, a protein that keeps supple and toned skin. The presence of macadamia oil in this valuable shaving cream allows an excellent blade scrolling over to soothe the redness caused by shaving. It's not a simple shaving cream, but a real beauty treatment, wrapped in the warm fragrance of bay rum. EXTRO COSMESI Donato Ciniello-Extrò Cosmesi. Donato Ciniello works in the world of cosmetics for over thirty years. But from less than a decade he's discovered a passion for the traditional shaving. Very soon this passion has become an important business (Extrò Cosmesi), with customers from all over the world. Its center of gravity is Settimo Torinese, where it produces and sells products such as razors, creams, soaps and shaving brushes, and where really it's created the so-called "free hand's wall", dedicated to those using traditional shavers.